This post kind of makes no sense. Just warning you, in case you end up wondering. I mean I did pretty great. I left for a month. I went to Rome, Florence, Milan, Paris, Rio, Sao Paulo, Ajaccio, Porto Vecchio and then again to Paris. I knew that I was only allowed one suitcase on a few of my flights so I had to be super minimalist. Oh here, let me give you a few techniques I’ve learned because I get a lot of e-mails asking for packing advice. Thin white t-shirts. They’re light and you can easily wash them by hand. In the same vein, I recommend washing your underwear by hand. It takes three seconds before bed and they’re dry by morning (My sister, the Perfecta Laetitia, taught me this one). White denim shorts. They get dirty easily, but they go with everything (and you can make your mother wash them as soon as you get to Corsica). Two pairs of jeans (one white, one cream). Not the most practical, but I’m just so obsessed with white these days. My military jacket, which works with everything. Classy pajamas that I have to show you so I can putz around all classy like (even though I sleep naked, like all top models) on vacation. A nice party outfit. Skirt + Peter Pilotto shirt, can be separated if needed. A white dress shirt, this one actually. Amazing, light, and goes with everything. Wear it to the beach or around town. A few silk shirts. Yeah, they’re light but they get wrinkly super fast. To avoid it, don’t fold them. Lay them flat, one on top of the other, right at the bottom of your suitcase. They’re super easy to wash by hand as well and they dry well if you put them nicely on a hanger. A travel outfit (sweatpants, ballet flats, scarf). Ah yes! Two men’s shirts, light and huge. I wear them during long shoots to protect me from the sun (+ my SPF50)(buttoned up all the way up my neck)(with sleeves down to my hands). Paranoid much? And then two pairs of sandals, one pair of heels, one pair of slippers, a scarf, and a few random things and there you go! I am just not the kind to pack them well without a whole bunch of little Muji containers. Soooo, I kind of end up bringing 25 liters of SPF 50, 45 hair products, big pschiiiiiiit of Evian… All of it. But still, I had done pretty great. Except by the end of it I couldn’t stand any of my clothes anymore. After a month of wearing the same stuff and even if you found a good way to wash everything, and even after a week of a fashion strike, you want to commit suicide when you look inside your Rimowa. Quick side note. Rimowa is a super pricey metal suitcase that’s supposed to last a lifetime. After this trip, it was just as beat up as I was. Wheels broken, metal torn (srsly) and the little clasps totally crushed. And it just so happens that the guarantee doesn’t work in New York, jerks. I was lucky that it didn’t explode in the bottom of the plane. What we’re leading up to here is that the last day of the last part of my trip from hell, I had no idea what to wear. Everything seemed dirty, ugly, so played out, blah, I was so tired of everything and I knew I was going to be filmed that day (for the behind-the-scenes of the shoot)(oh hell, getting filmed when you’re taking photos is the worst. You’re already ugly enough)(and compared with the top models all around me)(in a giant men’s shirt + SPF 50), yet still I was so suitcase depressed that put on my comfy travel pants – you see just how low I had fallen. 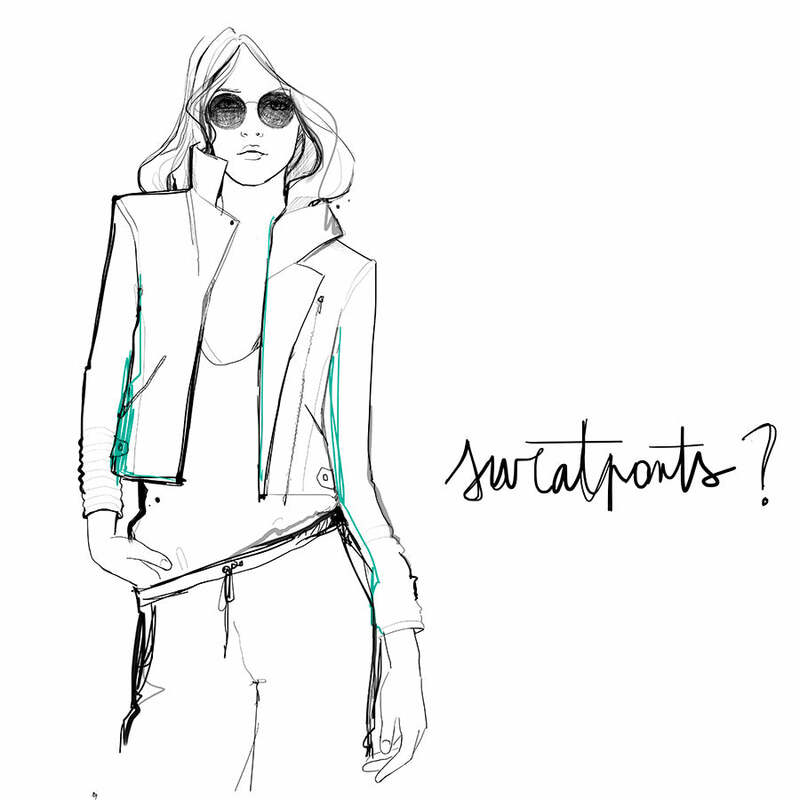 And it wasn’t like… Isabel Marant sweatpants with high heels and everything like in 2010, nope. Flats and only a t-shirt that barely survived the suitcase explosion. But seriously, everyone liked it. Everyone: the hair-stylist, the camera man, the artistic director, Lou Doillon, the baker, everyone. As far as I’m concerned, I packed my bags like a pro. Je trouve que tes meilleurs posts sont ceux “sans queue ni tête”! J’adore!! Je suis “heureux” (si je puis dire) d’apprendre que je ne suis pas le seul à avoir eu sa Rimowa totalement explosée après quelques voyages. Cette marque de bagages est totalement surestimée. The toiletries get me every time too!! I think I’m doing oh so well with my random yet completely overthought mix of “spartan chic” separates and then I lug my bursting-at-the-seams dopp kit in only to find it just won’t fit. Anywhere. Garance! I was on your flight from Paris to NYC Sunday (blonde, black & white striped top). You looked chic as always. I thought “why didn’t I wear my sweats like Garance?!”. Your packing advice will be very useful on my next trip. I didn’t want to bother you, but love your blog! Love it. That always happens to me. When I “NEED” to look good and I have nothing to wear and feel cute in nothing. So I just put on ‘something’ that I totally don’t want to wear but I have no choice left, and it turns out as a hit. Planning ahead doesn’t always work! Ce post est génial ! C’était ce dont j’avais besoin car je suis en pleine préparation de valise et tes conseils sont toujours top. Franchement, je dois dire que le contenu de ta valise me plait beaucoup, mais bon c’est vrai il n’y a pas trop de fantaisies -enfin sans compter l’ensemble Peter Pilotto que je te piquerais bien- parce que je suis du genre à emmener les pièces un peu folles de ma garde robe -style cette combi short imprimé papillon- que je mets jamais comme ça je les “teste” en vacances là où personnes ne me voient si c’est un plantage. Je suis la seule à faire ça ? Ce que j’ai remarqué aussi avec la tenue de sport, c’est que quand on la prend pas c’est à ce moment là où on en a soudainement besoin et au contraire lorsqu’on la prend on ne s’en sert qu’une fois et encore. Je crois que ça doit être un phénomène d’auto frustration parce qu’on aime vouloir ce qu’on a pas. Enfin bref comme toujours j’adore tes conseils mode et même si tu dis toujours que t’es pas une pro ben je peux te dire que tu me sauves la vie Garance. mais tu es une vraie parfaita!! bon pour rebondir sur ton post parfum d’hier, je suis parisienne et je porte bien mure et musc mais le mure et musc extreme et ça change tout! je ne l’ai senti que sur 2 ou 3 personnes depuis 5ans que je le porte! Mais à vrai dire ce n’est pas vraiment un parfum d’été car il est un peu plus ” lourd ” que le mure et musc classique mais si ça te tente sent le c’est une merveille! Comme quoi, c’est quand on est persuadé d’être à la ramasse qu’en fait non, tout le monde vous trouve si chic et “in”! Vaut mieux ça que le contraire, tu aurais peut-être moins assumé, non???!!! Garance! Try a TUMI suitcase…. Those do last a “model” travelling lifetime…. Hi Garance! I am trying to learn French so I always try to read your posts in French and then use google translate when I can’t understand something. I just thought you might find it funny that when I couldn’t understand “pour me la péter fille chic” I google translated it and it informed me that your pajamas are “farting girl chic.” Maybe I should use a different translation site! :) Love love love your blog! A partir de septembre je pars pour 10 mois à Rome, et c’est pareil je n’ai le droit qu’à 23kg de bagages. Je ne sais toujours pas comment je vais faire sachant que c’est le poids de ma valise pour une semaine de vacances (parce que je suis du genre “au cas ou, on sait jamais” donc je prend tout et n’importe quoi!) & surtout j’ai des produits de beauté par dizaines (& en grands tubes) Bref, je sens que ça va être compliqué cette histoire! I’m not by any means a model, but I do travel a lot for work and I love your sweatpants outfit. Over the years I’ve found that yoga pants and a flowy top are my go-to travel outfit, for all classes of travel, and recently found the perfect pair of pants: the “Everyday” pant by Lucy (around $80). They fit amazingly, look like business trousers, feel like sweatpants, and even have little zip pockets that don’t bulge like other pockets but are perfect for your boarding pass and a credit card or two. Bonus: they are lightweight enough to be comfortable in southeast Asian humidity and come in both black and gray. Highly recommend!